We the citizens of the world demand that Benjamin Netanyahu as person and Israel as the apartheid state is put on trial along with all the evidences that prove it to be a country responsible for terrible war crimes against humanity and people of Palestine in general. Why should Israel be put on trial? 1. At the time of writing this, Benjamin Netanyahu is responsible for killing over 700 civilians. Many of those are children, women and people with absolutely no affiliation with any group of any sort. They have been wiped off the map as if they were totally insignificant people with no right to live. 2. Israel has been bombing public places, schools, family homes, religious places and has sunk to the lowest level and recently attacked children hospitals. 3. They used White Phosphorus in 2009 and have used it again in 2014. They air-burst white phosphorus in 155mm artillery shells in and near populated areas. Each air-burst shell spreads 116 burning white phosphorus wedges in a radius extending up to 125 meters from the blast point. White phosphorus ignites and burns on contact with oxygen, and continues burning at up to 1500 degrees Fahrenheit (816 degrees Celsius) until nothing is left or the oxygen supply is cut. When white phosphorus comes into contact with skin it creates intense and persistent burns. 4. The establishment of settlements by an occupying power in occupied territory violates international humanitarian law which is the body of law governing situations of armed conflict and military occupation. Yet Israel is expanding it's settlements and will obviously take over the Gaza area as no Palestinian will come back since they have no place to call home. 5. Israel's apartheid setup where they have check-posts, blockades, and have taken every right from the Palestinians so they can't even breath without having an Israeli soldier on their back. This has to stop and it's nothing less than being a perfect definition of an apartheid settler state. 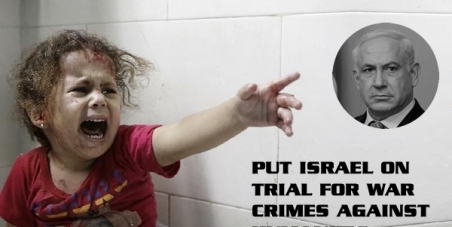 We demand that Israel is put on trial for war-crimes and Benjamin Netanyahu is held responsible for the deaths of all innocent people of Palestine along with being the reason for thousands of families being destroyed mentally and physically to the extent that they will never recover again. Mr. President, if you are unable to do this based on other evidence that you can get from Human Rights Watch, UN, journalists, and doctors in Gaza, I feel you are letting down billions of people worldwide by letting a criminal get away with it.